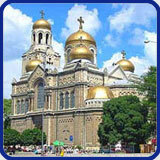 It is the most famous rock monastery along the Bulgarian Black Sea Coast, 14 km away from Varna. 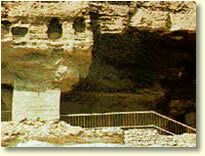 The cells of the monks and the chapel were carved into the soft sandstone forming a group of caves. The predominating opinion of scholars is that the monastery was under the influence of a religious teaching that was in circulation in Byzantium and Bulgaria at that time. It taught about the energy of God – “isichasm” or “hesychasm”. natural terraces, one above the other. In the past the church was richly decorated with wall paintings. Probably that is why the monastery was called Aladzha meaning “motley, multicoloured” .In 17th – 18th century the monastery was abandoned by the monks. 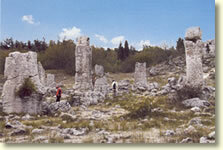 The natural attraction Pobiti Kamuni (The Stone Forest) is located in the western part of Varna lowland and it consists of cylindrical stone columns fixed in a small desert. The stone columns have porous surface and rise to an altitude of 5 – 6 m.
They are built of limy sandstones, containing many fossils – nummulites, mussels, snails. The majority have a smaller or bigger cavity, some are horizontally cracked. The cylindrical stone columns form several groups somewhere between the town Beloslav and the villages Strashimirovo, Slunchevo, Banovo and Povelyanovo with a total area of 50 km2. The first impression is of a ruined temple but scientists have discovered that it is a geological formation of stalagmites some fifty million years old. 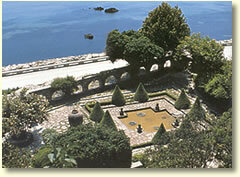 The former summer residence of the Romaniam Queen Maria has a striking effect of the vistor for its unique romantic design and atmosphere. (The area was part of Romania between 1913 and 1940). The Italian architects Americo and Augostino created and genuine legend matching the beauty of nature with the materialized visions of dreaming poets. 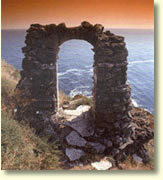 Thus, in 1926 they created one of the unique architectural ensembles along the Bulgarian Black Sea coast. This is one of the most charming places along the Bulgarian Black Sea coast. Jutting out for 2 km into the sea, Kaliakra is the longest cape along the Bulgarian Black Sea coast. Its name meant “Beautiful cape”. After the crimson colour of its cliffs. Put up in the Hellenic era, the Kaliakra fortress was at its heyday in the 14th century when it become the stronghold of the Bulgarian noble man Balik. During the Turkish invasion it was subject to an extremely cluel siege. All warriors and citixens of the fortress were murdered. Only 40 young maids were left alive. They decided to choose death to life in disgrace. When no one was watching them they plaited together their long hair, held their hands and jumped into the sea from the high cliffs.